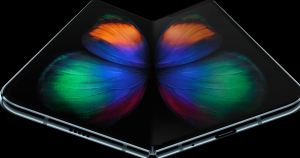 Korean tech giant Samsung officially announced its take on the growing foldable smartphone trend at its Galaxy Unpacked event today in San Francisco: the Samsung Galaxy Fold. The device will go on sale for $1,980 on April 26. We first got a glimpse of the device in November, but the brand has likely been working on the concept for almost half a decade. The Galaxy Fold will unsurprisingly pack some serious power, with a high resolution 7.3-inch Infinity Flex Display. When it’s folded in half — Samsung referred to that as “phone mode” — the display size is reduced to only 4.6 inches. It’ll also pack an impressive 12 GB of RAM and 512 GB of on-board flash storage. Competitors include Royole and Chinese phone maker Xiaomi. The latter is developing a smartphone that folds on both sides, like a birthday card. The device seems to be a little awkward to use in phone mode, but when unfolded, the Galaxy Fold could be a worthy replacement for a seven-inch tablet. The post Samsung Just Revealed a $1,980 Folding Smartphone appeared first on Futurism.